We took this photo on May 11, 1996. "Nierstraß" is a small town about 20 km. north of Aachen, Germany. You can see exactly where it is in the top right corner of this map of Limburg. Note that the German "sharp S", spelled "ß" is a ligature for the characters "sz". Since this ligature was not used in Dutch, the name was written "Nierstrasz". Nowadays in Germany it would be written "Nierstrass", hence the alternative spelling on the map. 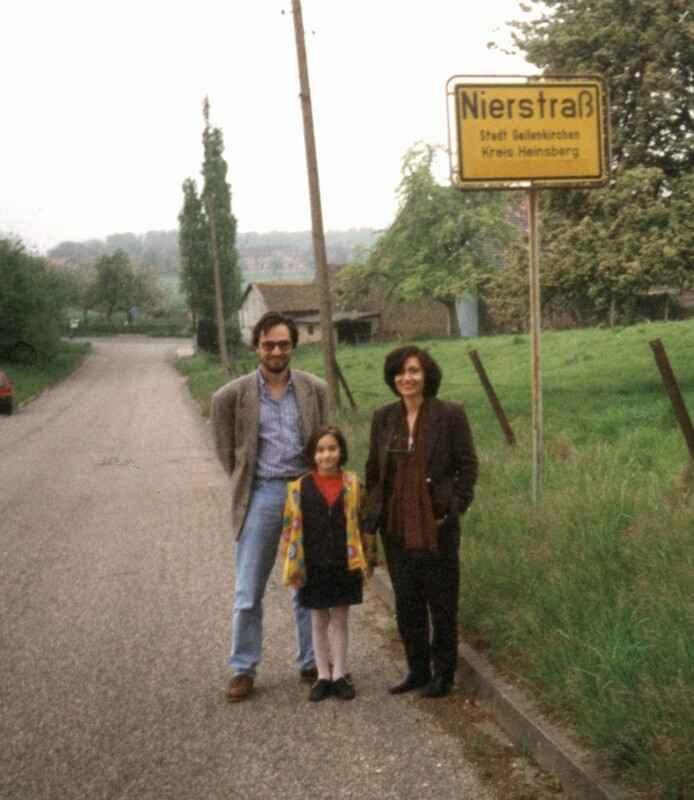 "Nierstrass" is a contraction of "Nieder Strasse", which means "Nether Street" or "Low Street". In fact, if you go there on foot from Geilenkirchen, you will follow a road that suddenly turns into a little gully with a cluster of houses. It is literally a "low street"! The earliest known person who used "Nierstraß" as a family name was Leonard Nierstrasz, who was born some time before 1600 and died some time after 1650. He owned a dyeing works in Eschweiler (~ 10km east of Aachen) that he apparently inherited from his father-in-law. On 28 october 1619 he married in Eschweiler with Maria Fliegen von Eschweiler. In his marriage contract, Leonard's name is given as "Leonard Conen von Nerstradt". Leonard's great-great gandson, Johann Leonard (1734-1813) became a citizen of Maastricht in 1813, and his son Hendrik (1773-1855) was mayor of Maastricht from 1835-1850.